Literally meaning soldier, they are gathered from throughout the empire to do the Sultan’s bidding. They know their audacity and ferocity on the battlefield will lead them to great rewards in the afterlife They are skilled and aggressive, as their name portrays, and are delighted to follow the Sultan’s army, wherever he wills, for conquest and glory. Clad in heavy mail, they are equipped to fight in dangerous engagements against numerous foes. 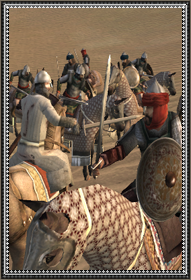 Smashing through enemies with a heavy lance is a favored tactic of these soldiers, who in dress and use resemble more their European rivals than the light Arab cavalry they descend from.